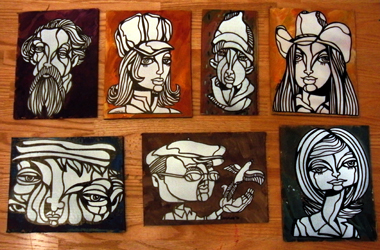 My submissions for the next "It's Yours Take It" Free Art event held in New Orleans. Media: Acrylic, spray paint, permapaques on cardboard. NoLA Rising has a long history of distributing artwork at no cost to the New Orleans area. After hurricane Katrina, it was a guiding mission of Rex to replace street signs and paint signs of hope for those who had returned to the city. One person made a movement of dozens of artists. For the fourth installment of New Orleans’ It’s Yours, Take it, Rex would like to continue the practice of a holiday art swap. For the third year in a row, artwork has been created and sent in for a toy for art swap to raise toys for the Marine Corps Toys for Tots program. The premise is simple: Someone brings a brand new toy in a box to donate to children and they get to take a piece of art with them. The toys are then donated to the Marine Corps’ Toys for Tots program for their annual distribution. Last year, we again had well over 120 toys donated for the cause and had a small garrison of Marines there to support the cause. As always, I encourage free and open themes for the work to allow you the freedom to work as you wish. This year, the work deadline will be Wednesday, December 8th, 2010. As of now, plans for where we’ll have the artwork are still not set. Trying to line up something in the next week. Worst-case scenario, I set up shop in the French Quarter and show people how we do it!